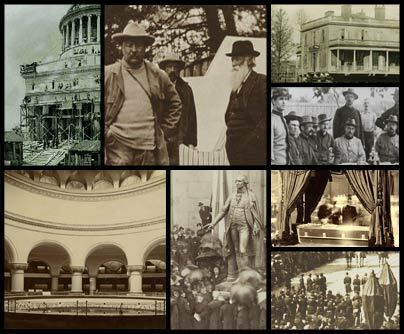 This archive is comprised of items related to the important individuals and events associated with six National Park Service historic sites in Manhattan and to the creation and preservation of these sites. The materials are diverse in type, ranging from photographs to letters to maps and prints. Explore some of these types below. Many of the books in the archive are associated with Theodore Roosevelt, having been written, owned, signed or inspired by him. 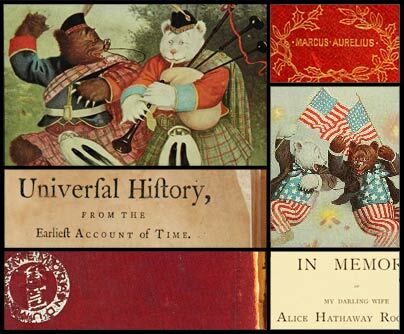 They include two "Teddy bear" books and a privately printed memorial book for Roosevelt's first wife and mother, who died within hours of each other. Among the other volumes several belong to members of Alexander Hamilton's family. George Washington is a popular subject of the prints in the archive, several of which were created in the 19th century after his death. He is often depicted as the General in military dress or as President of the new nation. Of note, is a print featuring Washington ascending to heaven surrounded by the symbols of the young republic. 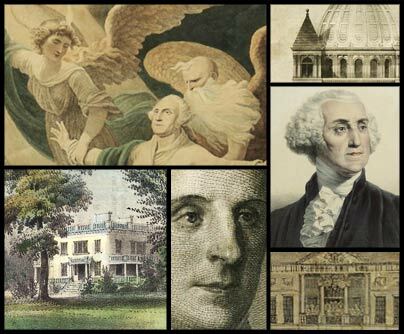 Other prints include views of Hamilton Grange in its early pastoral setting and a few early designs from the competition to select an architect for Grant's Tomb. The archive is rich in photography documenting Theodore Roosevelt's life as an explorer, colonel, President and patriarch. There are also many photographs showing the funeral of General Grant, the tomb under construction and subsequent memorial services. An image of Grant lying in state illustrates the early use of electric light in photography. Other photographs include Hamilton Grange at its previous locations and the interior of Castle Garden when it was the New York Aquarium. 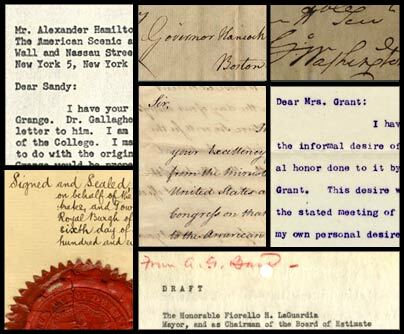 Letters in the archive chiefly concern the efforts to preserve Castle Clinton and Hamilton Grange and the correspondence documenting the erection of Grant's Tomb and the statue of George Washington at Federal Hall. Of note is a letter from New York City Mayor William Grace to Julia Dent Grant in 1885, proposing a memorial for General Grant in Riverside Park. Other noteworthy letters are from the period when the Continental Congress met at the original Federal Hall, including a letter from Nathan Dane a representative of Massachusetts to John Hancock regarding passage of legislation that put the Constitution into operation. The selection of drawings in the archive is varied. 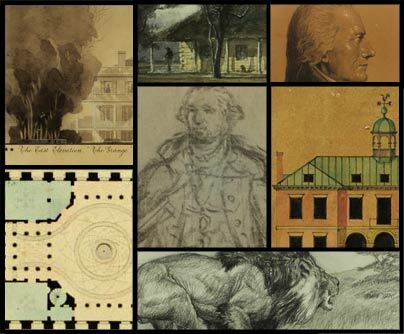 Highlights include original sketches of the statue of George Washington by sculptor John Quincy Adams Ward and drawings by William Hindley of the old New York City Hall, before and after it was renovated to become the nation's first capitol- Federal Hall. Other items include sketches of or about the life of Theodore Roosevelt. 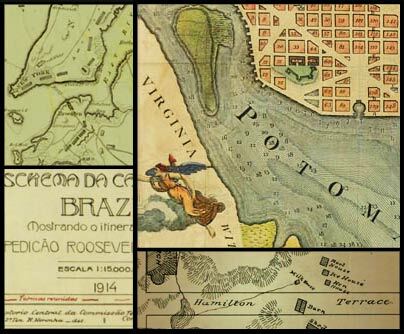 The small selection of maps in the archive feature disparate subjects from an engraving of Washington D.C. hand-colored by city architect Pierre L'Enfant to a manuscript map tracing Theodore Roosevelt's entire route during his famous expedition to Brazil. Also included are maps showing the position of the American and British armies before and after the Battle of Long Island and the original boundaries of Alexander Hamilton's estate. This project was made possible through a generous donation from the Leon Levy Foundation to the National Parks of New York Harbor Conservancy. Website © Copyright 2013 National Parks of New York Harbor. Also see rights information on individual pages as rights may differ for content related to individual items in the archives. For more information, see Rights & Usage.